CD Valdivia topped AB Ancud to advance into Liga Nactional Finals. Worth to mention a great performance of American forward Khapri Alston (196-94, college: Midwestern St.) who helped to win the game recording a double-double by scoring 16 points and 21 rebounds. His fellow American import Tracy Robinson (201-86, college: Loyola, IL) contributed with a double-double by scoring 14 points and 11 rebounds for the winners. American power forward Kwame Alexander (201-90, college: CS San Bernar.) answered with a double-double by scoring 18 points and 14 rebounds and Venezuelan power forward Francisco Centeno (203-85) added 11 points and 13 rebounds in the effort for AB Ancud. 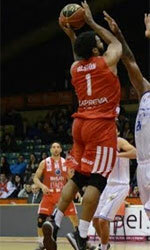 Four AB Ancud players scored in double figures.